Oil on canvas, 82 x 112 cm. Otto Bache possessed an incredible knack for observation and insight when painting animals. 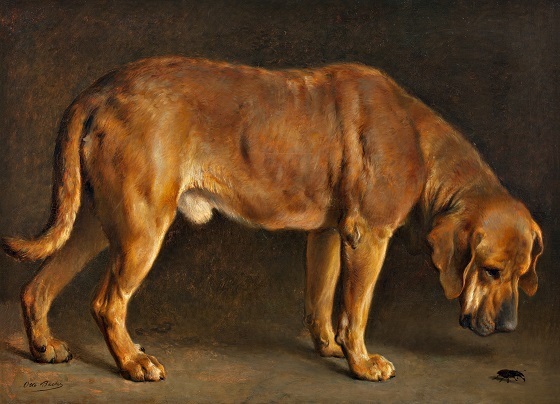 In this detailed animal study of a Broholmer dog, everything from the saggy skin around its neck to the powerful musculature in its legs has been depicted with painstaking care. Crawling along the ground is a stag beetle, which the dog examines inquisitively. The background is dominated by dark colours while an intense frontal light illuminates the folds in the dog’s skin and its muscular anatomy. This is a pre-study to the painting After the boar hunt from 1876 (National Gallery of Denmark), in which a number of hunting dogs and a hunter are depicted around a felled boar.